James Schramko, and this week we’re filming inside, it’s a little bit cool outside. I went to the dentist and I survived. But the reason I went to the dentist is they sent me a SMS follow-up on my phone. They just sent me a reminder saying it’s time to come back for check-up and this is about 1 year from my last visit. If you have a business, make sure you’re using customer reactivations. That could be a SMS reminder it could be direct response mail it could be an email. But stay in touch with your previous customer. 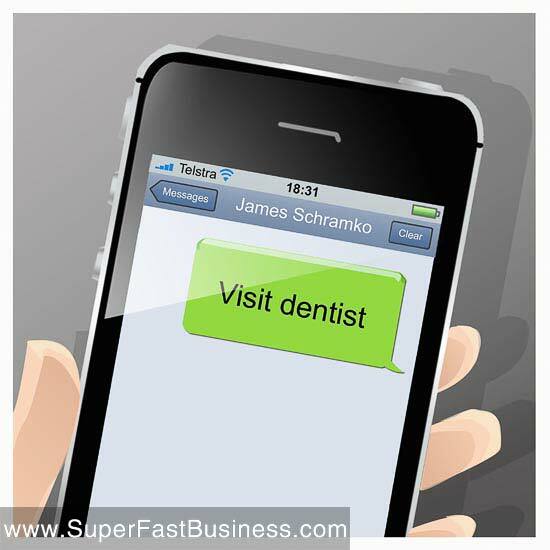 The chances are that if they didn’t send me an SMS, I would not be going to the dentist until I get my next filling required or some problem. So by keeping active maintenance they’re actually seeing their patients a lot more often. So put some activation mechanisms into your sales follow-up for your best customers. Whenever you do a new process, take notes, and I use a tool called Evernote to do this but these notes form the basic checklist for the next time you do the job and eventually in most businesses you’ll be passing that checklist to somebody else. And now that is an automated standard operating procedure (SOP). So every time I do a new process I take notes, I might jot them on a whiteboard then I’ll transfer them into Evernote into the minimum possible steps and then I’ll train someone else on it and now that person can do that task. And that’s how I keep adding new processes to our business and getting more things off my plate and into the hands of someone who can continually follow that process and then train other people on it. So I only have to do activities the first few times and then that’s it. Here’s a tip when you’re trying to sell something. If you want things to happen faster in your business, work on increasing cycle times. Cycle times are how fast you can turn things around. You do that by refining your procedures by questioning your assumptions. How can these things happen faster? How can we get to the next stage of the process quicker? Do we really need all of these steps in our process? Could we eliminate some and get to the final result much faster? If you’re a perfectionist for example, maybe you can reduce the need for everything to be absolutely perfect to get to a faster outcome. And then have it edit or review process as the final step before something goes out to the market. How do you have a successful routine where you identify that we are creatures of habit so you work on replacing bad habits with good habits and you put some structure in place. One of the things that I like to do is set calendar alerts. I use Apple products so I’m using iCal, but I set recurring reminders each week to do a specific task. Today, I’m doing my business update because a reminder reminded me to do my business update. Now after a few weeks it becomes habit. Now the reminder is just a little check, oh okay, yes I’ve done that and I tick it off. But should I forget, should I not want to dedicate a lot of brain capacity to try and remember when to do my business video update, my iCal will remind me. It’s an automated assistant if you like. So get into good routines. Here’s something that’s going on with a lot of businesses and I account it as a lot because we have a search engine optimization business. A lot of businesses simply have no idea where their sales are coming from. What you should do is track the source. Track and identify where are your buyers coming from so that you can go and get more of it. Put in ways to track the source. This could be for telephone numbers. One of the easiest ways is ask people who buy, how did you find out about us? When they tell you, start to collate that data and use that to improve your marketing process. I hope you’ve enjoyed this episode and I’ll catch up with you next week…. So often we try to get “new” customers… not very often we think to aim at the ones we have already served… great stuff James. Thanks for being a marketing titan and giving the free tips you give in these videos! Love it…all I need to say.